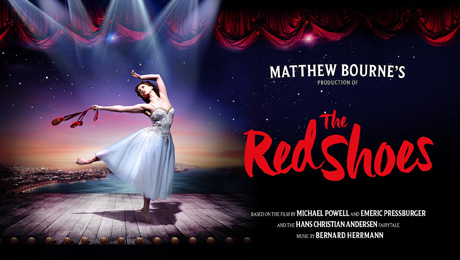 Matthew Bourne’s latest offering, The Red Shoes, is a real visual and imaginative treat. Based on the acclaimed 1948 British film starring Moira Shearer, which itself draws heavily upon and features a ballet adapted from Hans Christian Andersen’s ominous fairy tale ‘The Red Shoes’, it’s certainly a ballet with a lot of intertextual influences. The story, which has entranced film fans for decades, is a convincingly gripping one but undoubtedly takes second place to Bourne’s wonderful spectacle. Lez Brotherston’s exquisite production design forms a stunning backdrop to the choreography: everything from the clean painted lines of Monte Carlo to the ubiquitous rotating stage (in itself a very effective set-piece) is both functional and aesthetically pleasing. The score too – a new arrangement taken from the work of Hollywood golden age composer Bernard Herrmann – is a perfect, if surprising, fit. But Bourne’s choreography is, of course, the real draw. The mix of humour and pathos is a clever one and, although the finale is a little too abrupt for my liking, there’s no denying that Shaw not only dances, but also acts beautifully in the role of Victoria Page. During the rehearsal scenes, the sheer busyness of the stage is invigorating – ‘dancers’ are corrected on their movements as the ‘production team’ whirl around – and perfectly evokes the lure of backstage life with dizzyingly choreographed precision. The Red Shoes is a wonderfully engrossing production: a must for any fans of classical or contemporary ballet.